what matters most: extreme make-over...before...middle...and after! 13 years ago i was pregnant with rochelle and had a SEVERE case of nesting. it began when we were trying to figure out how to make room for #3. problem was, our 3rd bedroom was our office/den. and if you know us, then you know we can't be without a computer room in our home. as a result of 'making room for baby', nesting 1997 included: converting our garage into an office and raising the floor to match the level of the rest of the house, adding a laundry room out there as well, recarpeting the new baby's room, falling in love with new carpet in room, deciding to recarpet whole house, discovering that old bedroom doors no longer fit over new carpet, replacing all interior doors, and door frame trim, and baseboards, oh...and then prepping a cute nursery. a really cute nursery! i loved this room...a LOT! then rochelle grew up, and cole was born, and we just kind of stacked kids in this room. then, we just acquired more and more 'stuff'. kids stuff. boy stuff. everywhere. and because the room was so small, it almost seemed counter-productive to even attempt bringing order to it. so i turned my back, and acted like it didn't drive me absolutely CRAZY! when brittany left for byu last year, rochelle and cole each got their own room. 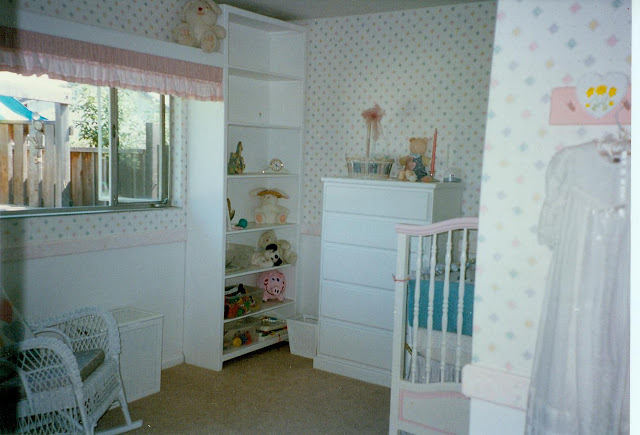 well, rochelle inherited a darling room brittany had fixed up so cute. and cole got this room to himself. and continued to collect more 'stuff'! after christmas cole got his aunt d's bed. we thought it could serve as a guest room when needed as well. but really? 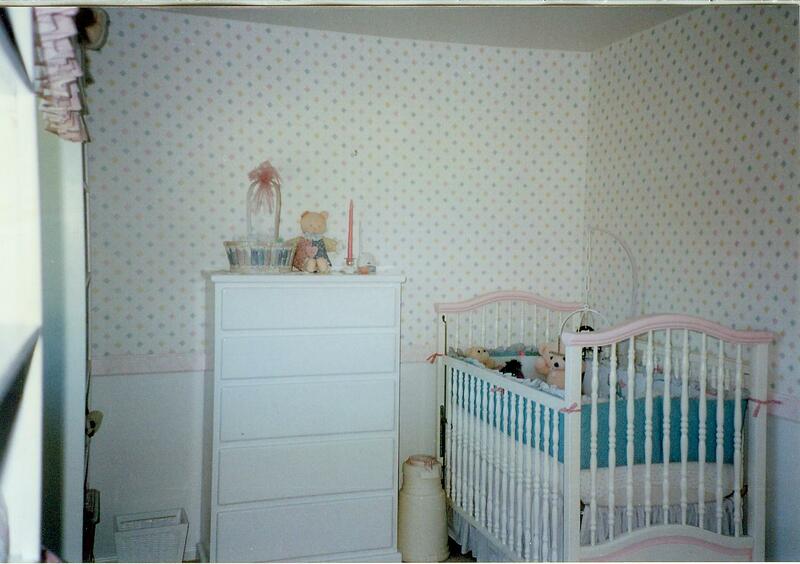 an 80's oak bed, with baby patchwork quilt wallpaper? not to mention the girly dresser. poor kid. the walls had to be textured and sealed against mildew. then the fun began! the painting! she painted much more than the walls. (ace paint; color-june lake). 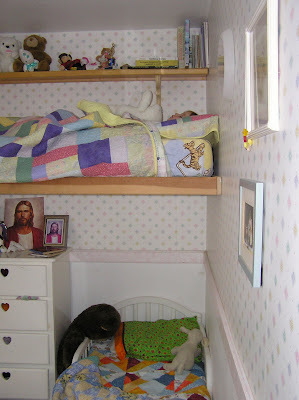 she painted the bed, bookshelf and dresser as well. well. it all started looking pretty darn cute, if you ask me! here's what we did with the dresser (you can see one heart still needs to be covered. just wanted to show how well we did changing a cute girls dresser into a true boy piece of furniture). and finally...here is the whole room. voila! i especially love how the ceiling color spills over to the top of the walls, and how the black wood trim makes it all tie together & look so sharp! couldn't love this room more! Oh my goodness, I love it!! My favorite part is the dresser - I can't believe that's the same piece of furniture! wow, that looks REALLY good!! i think the most impressive part is how you changed the dresser. i also love how it seems that you have a bed just stuck there in the wall. how did you guys do that? thx! we're pretty please with the dresser too!. kristine...are you asking about the loft bed? mark built a steel frame, which was trimmed in wood, and just bolted it into the wall at all studs. we did it in both bedrooms. the free corner needs support, so in one room we had a ladder be the corner support. in the other room we ran a link chain from the corner of the bed to the ceiling. 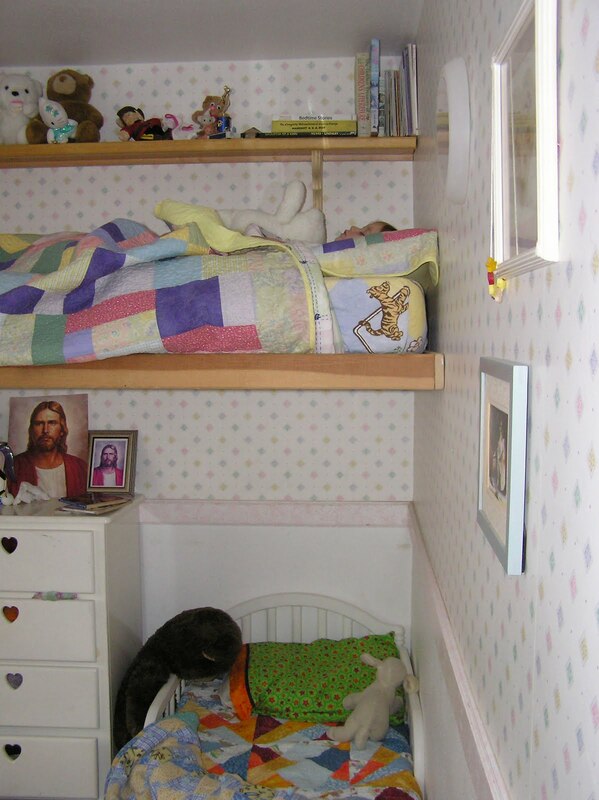 my husband had the steel, so they cost us about $15 each to add bunk beds to each room. it worked for years! and for cheap! LOVE IT!!!! That Brittney is a talented lady!! we miss you guys!